On Thursday, UFC president Dana White announced former middleweight top contender Vitor Belfort will face Yoshihiro Akiyama at UFC 133 on August 6th. MMA’s ultimate shot caller did not confirm which arena would host the Octagon’s return to the City of Brotherly Love. On August 8, 2009, UFC 101 took place inside the Wachovia Center in Philly. 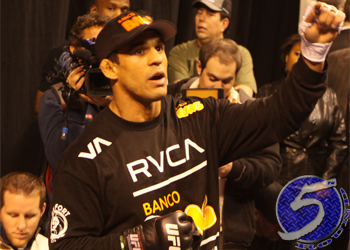 Belfort is looking to bounce back from his 1stRound knockout loss to Anderson Silva at UFC 126 in early February. He had won five straight fights prior to executing the face-to-foot defense against the 185-pound king. Akiyama is coming off back-to-back Octagon losses, and we all know what the reverse trifecta typically means… The Japanese star was last seen losing a unanimous decision to Michael Bisping at UFC 120. He was scheduled to face Nate Marquardt last month at UFC 128, but the tragic earthquake and tsunami that ravaged his homeland caused him to withdraw from the contest.